There was a time when achieving utterly realistic music reproduction was a singular goal. The advent of home theater has changed the landscape dramatically. Unless you can afford separate high-end systems for music and home theater, you need a system that can handle both with ease. For home theater today, engaging sound is an extremely important cinematic element. Have you noticed the technical advances promoted in the last few years by high-end cineplexes? They have generally centered around audio-related names like Dolby and DTS. High quality sound is critical to creating the ultimate cinematic experience and speakers are the weak link in the chain. So where does the quest for high quality audio begin? Perhaps this process may sound familiar: When I began my quest for perfect sound (admittedly years ago in the days of stereo), I conducted extensive research, visiting every audio store within reasonable driving distance. When I found the "speakers of my dreams," I saved for months until I could afford them. I couldn't wait to get home and unpack them. Of course, that initial thrill lasted only a day or so until I noticed sounds in my headphones that were not evident with my speakers. Disillusioned, I was forced to begin the process all over again. Today, assembling a dream sound system is an even more daunting task. The predominance of spoken word in cinema means accurate and detailed midrange reproduction is critical. (The human voice, especially female, is among the most difficult sounds for a speaker to voice properly.) Add the often explosive levels of low bass energy in today's movie sound tracks and you face a dilemma. Optimizing a speaker for human voice reproduction generally requires utilizing smaller diameter mid-woofers that are physically incapable of generating much in the way of low bass energy. On the other hand, using larger woofers extends bass response but compromises delicate midrange voicing. That is why most home theater speakers reproduce music poorly. Conversely, it is also why typical stereo speakers are not ideal for home theater use. What's more, both can be a source of listener fatigue. It would appear to be a no-win situation. Is it possible to design a system that excels at both music and film-based sound? Yes - while it may be difficult, it is possible. Matched drivers to create a smooth, seamless sound stage with no audible anomalies as sound moves from speaker to speaker•Wide dynamic capabilities to accurately and effortlessly handle elevated sound pressure levels (often found in contemporary film sound tracks) without losing the ability to image extremely soft and delicate passages. The resulting system will produce sound that is nothing short of stunning when driven by any quality solid state or tube amplifier. The music will magically open up and the speakers themselves disappear. The only thing that remains is the sound itself at a level of detail you have never before experienced. The problem is, speaker systems that meet these requirements will set you back from up to $40 to 50,000 oe more at retail. And even then, there may be compromises. Yes - a custom-crafted speaker system designed to both meet your technical specifications and perfectly match your acoustic environment, listening tastes and decor. 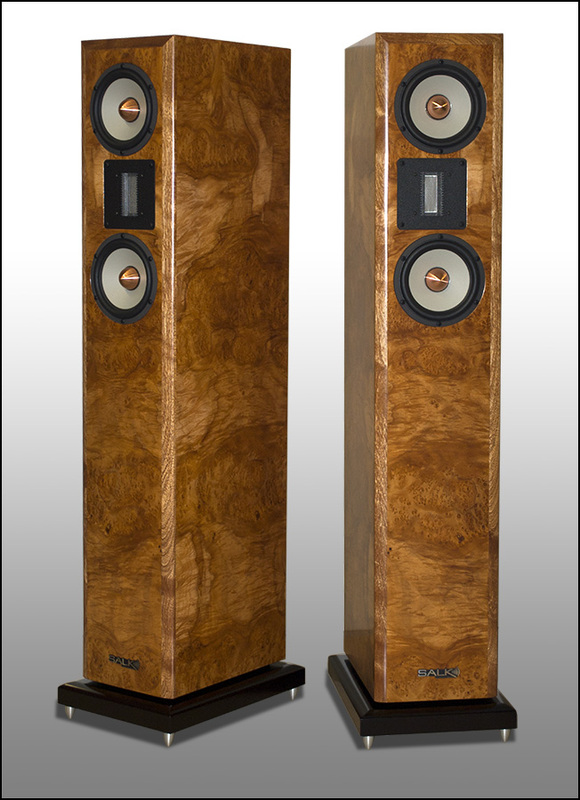 Many of our custom-crafted speaker systems start with intricate cabinet designs that are often far too labor intensive for most retail speaker manufacturers to consider. Precision cabinet parts are hand-assembled and finished in your choice of woods and stains. Choices include standard oak, curly maple, curly cherry, mahogany and curly walnut. They also include premium woods like rosewood, bubinga, lacewood and even more exotic burled woods.The dyeing options include virtually every color of the rainbow. And automotive colors expand the universe of possibilities even more. Imagine, for example, a birds-eye maple speaker with a translucent plum-colored dye. Final finish options include satin or gloss, even hand-rubbed high gloss at your option. Once the custom cabinets are complete, they are fitted with the world's highest quality drivers and premium crossover components (some of which are built by hand), all individually selected and matched for sonic uniformity. Finally, the speakers are fully tested to insure they exhibit near-perfect musicality. The result is a one-of-a-kind sound system that is stunning in every respect - musically and visually.Are they expensive? That depends on your perspective. With our custom systems, you deal direct and avoid the standard 50% markup required in normal retail channels. So even though our speaker systems equal or outperform their stratospherically-priced counterparts, you can expect to save 30 - 50% over the cost of a retail speaker. No longer will you focus on how good your speakers sound. Your dreams realized, you are finally free to explore musical detail you never imagine existed. And you will likely never need to save for new speakers. These just may be the very last you are likely to purchase.